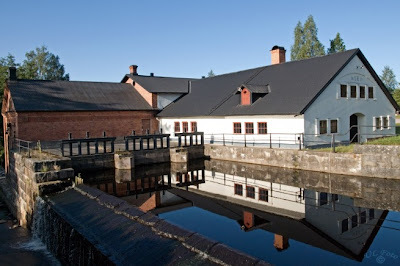 Our Whisky World Tour now takes us to Gävleborg County, Sweden, to the home of the first Swedish Whisky: Mackmyra. Scotch whisky is well loved in Sweden, but until 1999 there was no Swedish whisky. That year eight whisky-loving Swedes went into business to fill that gap. They tinkered around with many recipes until establishing a fruity malt and a peat-ish (courtesy of juniper-and-moss drying) malt. In 2006 they started some limited local releases, the Preludium series, which were an instant success. In June 2008 they launched First Edition in the UK market to considerable acclaim, and have since released additional series named "Special" and "Moment". In 2009, their production reached 200,000 liters (about 450,000 bottles), which sounds considerable but is tiny compared to the Scottish distilleries. In 2010 they began construction on a new distillery that they hope will expand their annual production to 2 million bottles. HERE COMES THE BIG SELLING POINT. For me at least. All of the casks for this First Edition were matured in 50 meters underground in an abandoned mine. Top that one, Scots. Add to that the fact that they mature some of their spirit in actual Swedish Oak (which, I read somewhere, came from a Swedish Navy shipyard; I wish I knew the source because that's weird enough to be true), and I was quite excited to try this whisky. Plus my wife is a fan of all things Swedish. So I bought a dram of this from Master of Malt, several months ago, and queued it up for this whisky tour. Definitely not artificially colored: Light amber meets Pinot Grigio. The nose starts out with a hint of yeast followed by porridge (hot cereal) and a little butter. It's very fresh and light. No oak, no bourbon. The palate is lightly smoky, and toasty. As in toast and toasted wood; followed by an herbal (juniper-like) note. Very clean. Very pleasant. It finishes nice and warm, holding that herbal note. Ah, water brings out the sweets. The nose becomes more candied. Some sweet oak effects. Honey and granulated sugar peek out of the palate, along with some more smoke. The finish becomes brief. It's incredibly minimalist, like modern Swedish design. No trumpets, no curlicues. Maybe it's the underground climate, maybe it's the Swedish Oak, maybe it's the Swedish. This is a very subtle whisky. It whispers. As Serge Valentin said, it's "far from Scotch." And that's a good thing. It's exciting to be present for the creation of new whisky. 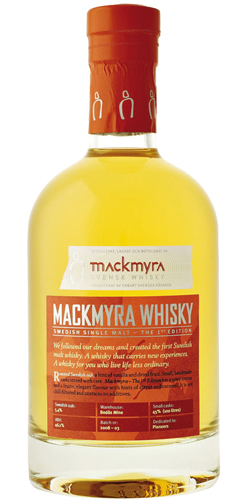 It'll be great to see what happens when the Mackmyra spirit gets 8 years on it. In the meantime, Mackmyra's success has led to fourteen new malt whisky distillery projects in Sweden. On Wednesday, the Whisky Tour will take us to Southern Netherlands. It is unlikely that there will ever be an 8-year Mackmyra. They seem to target younger audiences with a lighter flavor, and they even introduced an even more raw version in Sweden. They promote mixing drinks with it as a base. I'm speechless. Also, for cask owners, they now force new owners to bottle their cask at 5 years. So you won't be able to get a hold of any that way either. Keep in mind that the 30 liter casks does mean that they mature quicker. I've tasted from my own 7-year old cask, and it's very heavy on the sherry flavor from the cask. Congrats on your cask! 30L means tons and tons of oak contact. Sherry must work well with their spirit. Having chatted with a few folks about buying a cask, our pipedream always ends abruptly when we get to the subject of bringing the whisky back to the states. And, yeah, I'm always shaking my head in disbelief at almost every whisky brand website still promoting tons of ice and/or mixing. They may sell more bottles that way, but the customers aren't even tasting the product.